"Did I ever tell you about the first time I did heroin?" Amid the buzz generated by Leonardo DiCaprio's Oscar-nominated turn in Blood Diamond and equally riveting work in Martin Scorsese's The Departed, Palm Pictures has re-released one of the actor's earliest film successes�which also just happens to co-star his dear Departed colleague (and fellow Oscar nominee), Mark Wahlberg. To its diehard cultists, The Basketball Diaries is a searing, painful portrait of teen drug abuse and the societal and familial pressures that lead young lives astray. But anyone more than a few years removed from the angst, confusion, and disillusionment of adolescence will have trouble relating to Scott Kalvert's movie, which resembles a hundred other cautionary tales that use a scared-straight approach to preach their message. Based on the autobiographical novel by Jim Carroll, The Basketball Diaries chronicles the wrenching descent of a talented high school athlete into the black hole of narcotic addiction. Jim (DiCaprio) lives with his slovenly but caring mother (Lorraine Bracco) in a Bronx tenement, attends a rigid Catholic academy, and pals around with a trio of basketball teammates (Wahlberg, James Madio, and Patrick McGaw), with whom he gets high and makes mischief. He also excels at writing, and fills countless notebooks with poetic musings and quixotic observations�most of which sound self-conscious and pretentious when used as voiceover narration. His "normal" life, however, quickly goes south when his best friend (Michael Imperioli) dies of leukemia and his coach (Bruno Kirby) makes a sexual overture. Heroin helps salve the wounds, but Jim's growing dependence on the drug so alienates him from his school and family, he winds up a street junkie who steals, assaults, and even prostitutes himself to get a fix. With his hoop dreams shattered and his life in tatters, Jim lives a dangerous day-to-day existence, until a childhood mentor (Ernie Hudson) helps him claw his way out of the gutter. Part Catcher in the Rye, part Afterschool Special, The Basketball Diaries pulls no punches in its depiction of the drug world's underbelly. Watching these desperate kids systematically destroy their lives is by no means a pleasant experience, especially for parents of young teens (of which I am one), but the unsettling images don't necessarily inspire sympathy for the characters. Call me heartless, but Jim (a poor man's Holden Caulfield) and his cohorts make a conscious choice to dive into the cesspool of substance abuse, and must deal with the consequences of that fateful leap. Like most teens, they take risks and push the boundaries of authority, but their limited maturity is no match for their insatiable desire for sensory experience. Jim never dreams his recreational usage will blossom into addiction, and though we may rue his ignorance and lost promise, it's difficult to feel sorry for him. Perhaps if Kalvert devoted more time to Jim's recovery and the challenges of that Herculean task, we might embrace him more completely and admire his fortitude. Instead, the director seems content to wallow in Jim's downward spiral and the opportunities it affords for psychedelic dream sequences and seamy situations, all of which he films with relish. Strangely, the movie only comes alive visually when Jim is high on smack�an unfortunate paradox that dulls its anti-drug message. A trite script also hampers the production, although the fine cast does its best to milk the most drama from it. 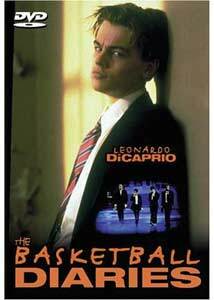 DiCaprio may look clumsy in the basketball segments, but otherwise he's the quintessential tortured teen, balancing myriad emotions and attitudes as he wades through treacherous waters. Though his acting lacks the maturity and refinement of his recent portrayals, the seeds of greatness are there, and his work distinguishes an otherwise ordinary film. The flipside of Less Than Zero (made eight years earlier), The Basketball Diaries proves the only difference between rich, suburban L.A. druggies and the poor, urban junkies of N.Y.C. is their material trappings. Jim and his buddies don't possess fast cars, hilltop homes, or designer duds, but they can beg, steal, cry, and sexually debase themselves just as well as their more affluent West Coast counterparts. Yet thanks to DiCaprio, The Basketball Diaries possesses a more realistic look and feel, even if, when all is said and done, it's little more than a protracted anti-drug commercial. Unfortunately, its R rating prevents it from fully reaching�and influencing�its target audience. Image Transfer Review: It's doubtful The Basketball Diaries has received any sort of video upgrade since its initial DVD release in the late 1990s, but it's sorely in need of a major overhaul. Littered with nicks and dirt, bathed in grain, and sprinkled with video noise, the transfer resembles one of the skid row bums with whom Jim fraternizes. An overall fuzziness reminiscent of a mild drug trip also clouds the image, making details difficult to discern and lending the film a dull, dated look. Audio Transfer Review: The DD 5.1 track pumps out some decent audio and especially springs to life during the myriad soundtrack tunes by The Doors, The Cult, and PJ Harvey, among others. Though the rear channels rarely kick in, there's enough front action to enhance the drama, and dialogue is always clear and comprehendible. Extras Review: The main supplement is a collection of nine interviews with cast and crew, although they're really just random sound bytes touting the importance of the film's anti-drug message. At 92 seconds, DiCaprio's interview is the longest, while Lorraine Bracco's is just a joke at seven seconds (yes, seven measly seconds!). Director Scott Kalvert provides the most prescient comment, prophesizing that Leo will be a legend by the time he's 40. Two TV spots, an anti-drug PSA, and a two-and-a-half-minute promo for other Palm Pictures DVD releases round out the extras. The Basketball Diaries resembles countless other anti-drug films, but the work of Leonardo DiCaprio and company lifts it slightly above others in the genre. Fans of the actor (and those unfamiliar with his pre-Titanic work) should consider a rental, but poor video quality and a dearth of extras preclude a purchase.